Thermoplastic materials loose strength to pressure and tension with increasing temperature. 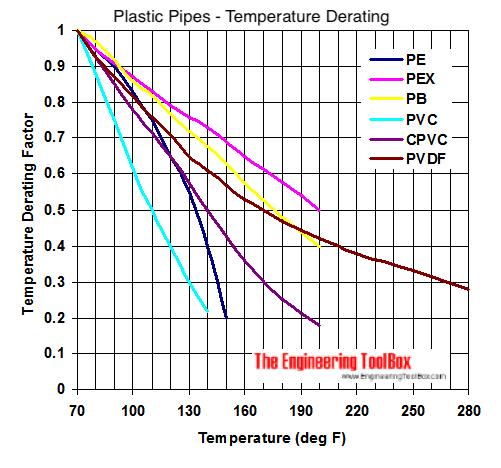 The table below can be used as a guide to common thermoplastics and their derated strength with temperature. Manufacturing data should always be consulted. 1) The thermoplastic is not resistant for long term service at this temperature. Operating conditions should be avoided. Engineering ToolBox, (2004). Thermoplastic Pipes - Temperature and Strength Derating. 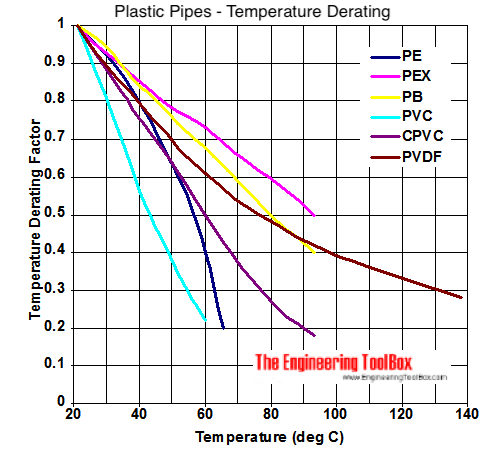 [online] Available at: https://www.engineeringtoolbox.com/thermoplastic-pipes-temperature-strength-d_794.html [Accessed Day Mo. Year].